While he moved to Los Angeles with his family at the age of five years old, Slash was born in Hampstead, London. He acquired the American citizenship in 1996. Slash owns a pet anaconda named Sam. He has been known for his love for reptiles and he has also appeared in several music videos and photo shoots with his pet snakes that he had to get rid off after the birth of his first son in 2002. Slash particularly loves the horror genre. “Nothing Left to Fear” is one of the films produced by Slasher Films Production Company. 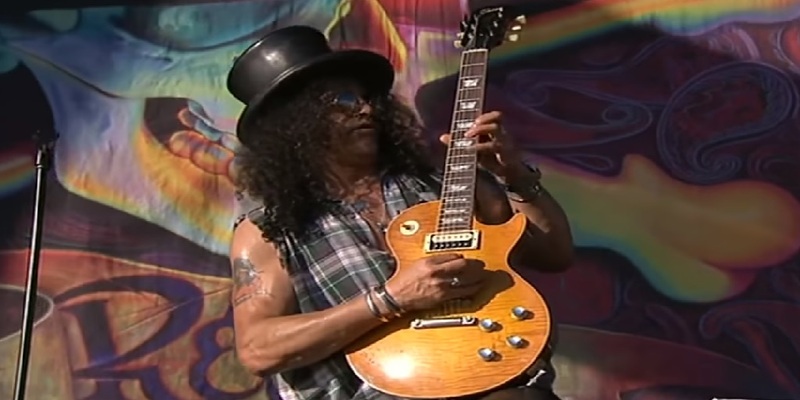 Slash is notable for wearing a top hat during his performances. He was looking for something cool to wear to a gig he had. He didn’t have the money to buy the hat or the Concho belt that he puts around his hat – so he went on to shoplift both. While on a gig for Hard Rock in Orlando, he saw a guitar sitting in the dressing room and as there was no one there to claim it so he simply took it. Years later, he returned the guitar back on an event organized by the Hard Rock. Good guy, Slash! 6 - Slash is a Dinosaur Geek! While a lot of us can’t even pronounce the names of different dinosaurs, Slash can even tell the difference between the different kinds. Slash has mentioned that on numerous occasions that while he might not look like it but he’s a huge nerd when it comes to reading books. He also said ““We’re on the road all the time, so you take a lot of books with you and you just sort of kill time reading”. His first guitar was an acoustic Spanish flamenco and the guitarist says that as he did not know how to put strings on it, he would play the one string that it already had. Slash says that he wears sunglasses during performances because he’s too shy to look at the audience. Slash’s mother worked as a costume designer for a number of famous artists including David Bowie while his father created album covers for Neil Young and Joni Mitchell. A lot of you might not know but Slash is an animal rights activist and an environmentalist too. When Slash came to know about an endangered Asian elephant’s habitat being under-funded at the LA Zoo, he filmed a YouTube broadcast to highlight the issue to the Los Angeles City Council. He was diagnosed with cardiomyopathy which was caused by his intense drug and alcohol abuse. The doctors gave him six weeks to live but he survived with the help of medical procedure and quitting his old habits. I'm Joanna, nice to meet you. I like to play the guitar, I do play the guitar. Play for more than 20 years. I like to share my thoughts about the world of the Guitar, I do write for GuitarHertz.